These Limb Wraps harness Infrared thermal energy and use it to penetrate target areas of the body such as arms and lower legs. Designed for safety: soft waterproof fabric with flexible tensile capabilities whatever the sitting or standing position. Safe heating circuits are designed to withstand any stretches or bends. This system adopts space-age Infrared carbon-fiber technology together with an advanced electronic control system. 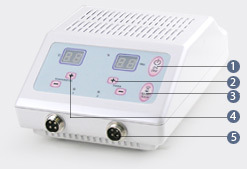 Allows easy adjustment of temperatures and times for individual needs in one or both wraps simultaneously. Strap the Far Infrared Limb Wrap around the chosen body part (arm, lower leg, thigh). The Far Infrared Limb Wrap should completely surround your body without becoming creased, doubled over or folded. 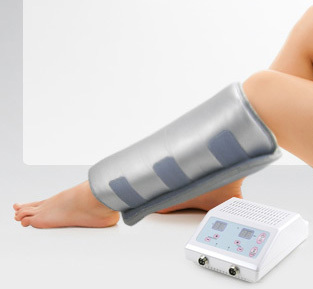 To achieve the heating effect, do not strap the Far Infrared Limb Wrap on too tightly. Check to see if your household voltage is the same as that printed on the plug before plugging the device in. 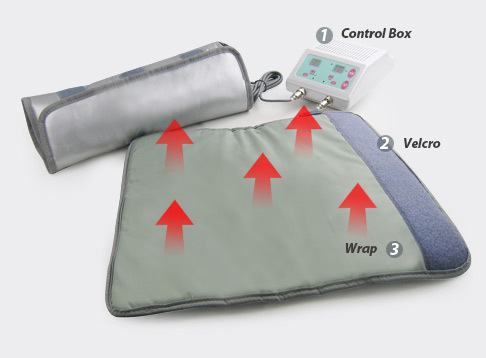 Connect the Far Infrared Limb Wrap to control box (either one Wrap in one connection, or both wraps in both connections) and plug in. At the end of the session, towel off the sweat and wait 15 or 20 minutes before showering or having a bath, eating or drinking cold drinks. Do not worry if your skin is reddish: this reaction is due to the constant temperature it has been exposed to and will disappear after a couple of hours. Once you have finished your session, take off the Far Infrared Limb Wrap and spread it out on a flat surface until it cools down. Then clean it with a damp cloth and dry it. Store in a dry place.